Rep. Chris Swedzinski was recognized by MnRA for his work on a 2017 local notification law last week at Retail Rally. 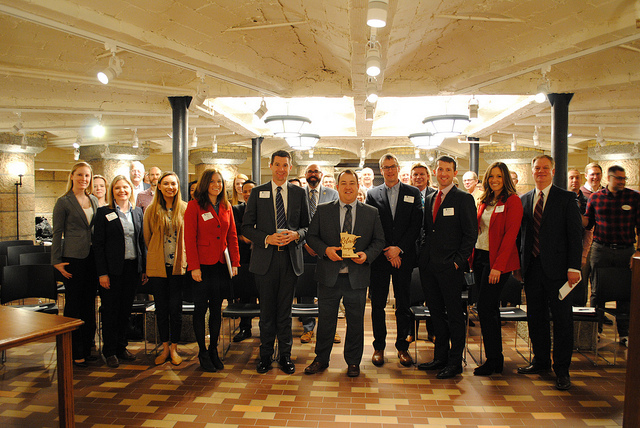 This past Tuesday, retailers gathered at the State Capitol for our 9th annual Retail Day At The Capitol. In addition to a kick off breakfast featuring Senate Majority Leader Paul Gazelka, Senate Minority Leader Tom Bakk, and House Assistant Minority Leader Tony Albright, MnRA recognized Rep. Chris Swedzinski for his work on a 2017 local notification bill that was signed in to law. 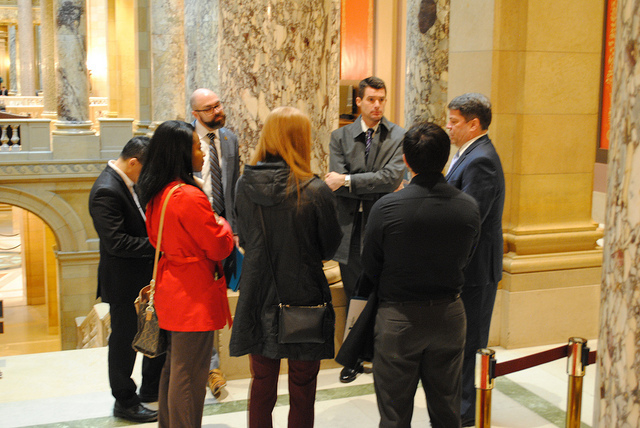 Attendees were also briefed on legislative updates by MnRA staff. In welcoming attendees, MnRA Board Chair Emily McGann (CVS Health) reminded the crowd of the importance retail in Minnesota and bringing that story to the capitol. "As retailers we support 788,000 jobs across this great state-that's one in five jobs. And as we have noticed over the last few years, it's easy for people to forget the importance of retail. Retailers invest in our communities through property taxes. Retailers pay income taxes. Retailers support local causes through charitable giving and volunteer service. And retailers are the number #1 private sector employer across the country, providing training and advancement opportunities to so many Minnesotans. Today is our opportunity to tell our retail stories," said McGann. Following breakfast, retailers met with their elected officials and key legislative leaders. Through the 75 conversations that day, the message that retail impacts 788,000 Minnesotans in every community was strongly delivered. 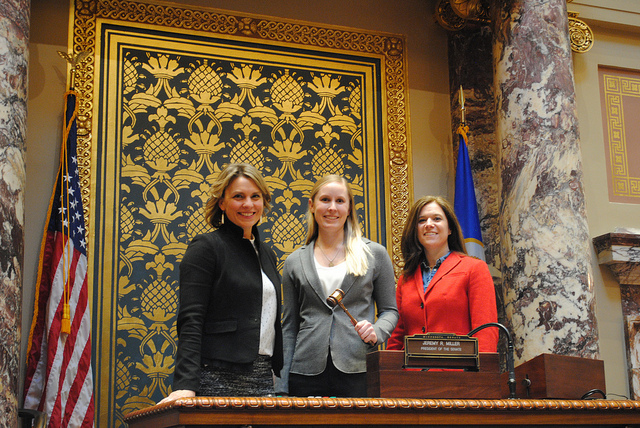 Chair Emily McGann (CVS Health, center) with Kate Blair (Speedway, left) and Tracey Hester (Target, right) at the Senate President's podium. Attendees with Senate Majority Leader Paul Gazelka. Members gathered outside the Senate chamber. 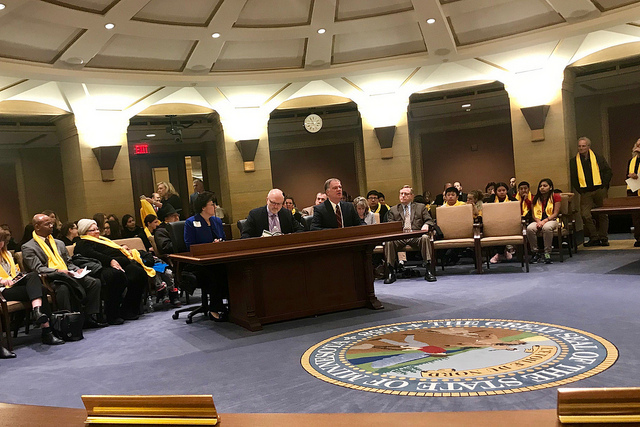 Hillary Feder (Hillary's) and Bruce Nustad (MnRA) testify in support of vendor collection allowance before the Senate Tax Committee, pictured with bill author Senate Tax Chair Roger Chamberlain. As the trade war drags on, new data shows that tariffs are a growing drag on U.S. businesses and the economy. The price tag for the trade war has now reached more than $20 billion with American consumers – not other countries – bearing the bulk of that cost. While that number alone is far too high, it doesn't include the cost of retaliatory tariffs that are causing exports to plummet, or the price of programs that are paying our farmers for the losses they have incurred, or the tariffs’ ripple effects on the broader U.S. economy. It also doesn’t include the cost of uncertainty the trade war has created that is preventing American businesses from being able to plan for the future, invest and grow. Across the country, tariffs are taking their toll on American businesses and families. It’s more apparent than ever that the trade war needs to come to a swift end. 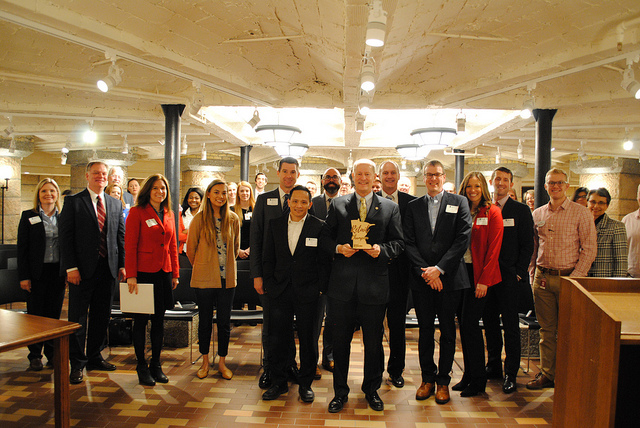 When innovative retailers and their partners gather, learn and celebrate at Retail Rally in October, we'll roll out the red carpet to recognize 10 Minnesota organizations and individuals for being champions of the industry. Nominations are open through April 8 and can be done at www.retailrally.com. Take a moment to nominate a Minnesota Retail Champion today! Minnesota employers cut 8,800 jobs last month, causing the state’s unemployment rate to rise to 3.1 percent. The jobless rate rose from 3 percent in January, according to a report released Thursday by the Minnesota Department of Employment and Economic Development, or DEED. “We know that Minnesota faces dwindling labor force growth,” DEED Commissioner Steve Grove said. “We can’t have job gains without people to fill the positions.” The brutal February weather in Minnesota may also have played a role, with construction employers cutting 3,800 jobs that month. That industry’s trend, though, has been upward over the past 12 months. Meanwhile, Minnesota lost 1,364 jobs over the past 12 months, making February 2019 the first month to show an annual job decline since July 2010. Professional and business services led all sectors with 1,300 new jobs. Financial activities added 1,000 workers. Government increased by 400 jobs. Trade, transportation and utilities cut 3,000 jobs. nder the Tax Cuts and Jobs Act, remodeling and other improvements to stores or buildings were supposed to be fully depreciated in the first year the work is done. Instead, a mistake in the legislative language requires that depreciation be done over 39 years. As a result, companies can only deduct 2.5 percent of costs in the year the investment is made and deduct the remaining 97.5 percent over the following 38 years. Nely Bautista found herself the victim of an increasingly worrisome type of theft in the Twin Cities when an employer refused to pay her for a two-week gig cleaning apartments. State officials who promise to crack down say the 43-year-old Savage woman is one of tens of thousands of Minnesotans who fall prey each year to wage theft when employers withhold money earned on the job. The Department of Labor and Industry estimates that roughly 39,000 Minnesotans miss out each year on nearly $12 million from employers who do not compensate them for their work — including failing to pay overtime, misclassifying employees as independent contractors or, in Bautista’s case, declining to cut workers a check at all. One Senate bill would require employees to first file written complaints with their employers before the Labor Department could start its own investigation. “We just want to make sure we’re not creating criminals out of honest, hardworking folks,” said Sen. Eric Pratt, R-Prior Lake, the bill’s chief sponsor. Providing hourly employees with a specific technology tool is critical to keeping them engaged, according to a new survey. Results from “Embracing a Bring Your Own Device in the Workplace,” a survey of 1,000 U.S. hourly employees in five service industries, including retail, from workforce management technology provider WorkJam, indicated bring your own device (BYOD) policies drive employee engagement and productivity. More than two-thirds of respondents across all industries surveyed (retail, hospitality, logistics, healthcare, and banking) said they would use their personal mobile devices to access information about scheduling changes and/or corporate training materials. This includes 66% of retail respondents. Another 8% of retail respondents said they have no preference. The study also finds that 69% of hourly employees believe that with the right application, they’d have an easier time picking up shifts that accommodate their schedules. And 57% of millennial respondents would prefer to use their personal mobile devices to access information such as schedules and training materials. Furthermore, engaged employees are less likely to consider leaving their jobs. The study shows that 61% of frustrated employees cite scheduling and communication pain points as reasons for leaving, while of 56% of employees looking for jobs say they are prevented from maximizing their potential at work.